One of the most awesome things we do at our Cub Scout day camp is building wood projects. For some of our boys, this is the first time they’ve used hammers and screwdrivers. The boys (and their parents) are so proud of their projects! Our wood projects list by rank has been the same for at least the last seven years since I’ve been involved with the camp. The items vary in difficulty depending on rank. We continue doing the same wood projects every year so that if a boy comes to day camp every year, he’ll have five different projects. In the 2015 Cub Scout program, there are two adventures that involve building something out of wood. Even though the other ranks aren’t working on an adventure by making a birdhouse or tray, they are working on skills that will be important for them in the future. Bear Required Adventure: Baloo the Builder 3: Assemble your materials, and build one useful project and one fun project using wood. Webelos/AOL Elective Adventure: Build It 2: With the guidance of your Webelos den leader, parent, or guardian, select a carpentry project and build it. You can download the instructions and the accompanying diagram by clicking on these links. I calculated the cost of the project by using the Home Depot online prices available through my affiliate link (at no extra cost to you). I used the best price available, so the price for 66.5″ of 1″ x 4″ pine was calculated based on a 1″ x 4″ x 8′ board. The retail price total is $5.77 per tray. My post about building chairs has some ideas on ways to get lumber more inexpensively for your wood projects. Our boys go to the wood shop for two back-to-back 50 minute sessions on two consecutive days. The Wolves usually finish their trays a bit early, depending on how much an adult helps them. Drilling pilot holes for them speeds up the process, so I recommend that you do this for the boys. I estimate that it will take your Wolves about 3 hours to do this project. This time would include a short safety talk. After doing this for so long, we’ve learned some things. Here are a few suggestions for you. Pre-cut the wood. Since we have 200 boys at our camp, there are usually a couple of wood cutting parties before camp. Pre-drill pilot holes. This will help the boys who have trouble driving in the nails. Have plenty of helpers. Our local Boy Scout troops help us during day camp. If you’re doing this as a den or pack, contact the troop to ask for help. The Cub Scouts should write their names and den numbers in crayon on all of their wood pieces as soon as they get them. You’ll want to keep your lumber covered. The National Guard loaned us “GP Mediums” (large canvas tents) under which to store the wood at day camp. If you’re working with fewer boys, you can store it in your garage. The boys will be so proud of their accomplishment when they finish their trays! If your Cub Scouts make the trays, let me know! I would love to see a picture of them. P.S. Take a look at the chairs that our Arrows of Light made! Do you have the plans for the others you listed by rank? You describe the Bears making this tray in the post above, but it is listed for something for the Wolves to do in the listing above. Do you have the directions for the birdhouse and the table? Hi, Joy! Thanks for reading! I do have the other plans, and I’m hoping to get them up soon! Sorry for the confusion about ranks. This is a project that Wolves do at my Cub Scout day camp. 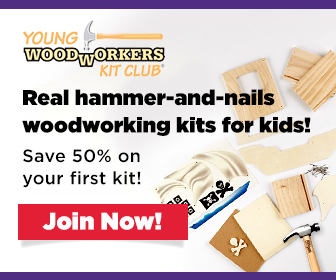 It doesn’t fulfill any of their adventure requirements–it’s just a great project to start developing some basic skills (like how to hammer without taking someone’s fingernail off! 🙂 ). Bears and Webelos do have a requirement to make something out of wood, so they could also do this project to fulfill an adventure requirement. I hope that makes sense. Let me know if it doesn’t. I am the Day Camp Chair for our district and would love to incorporate the plans for the other woodworking projects as well. Presently Home Depot volunteers their time and donates the woodworking kits for our scouts. We also have about 200 boys each year for camp. Hope you can share soon. Thank you so much! Wow! What does Home Depot volunteer to do? Here are the plans for the chest. I’ll get the table plans up as soon as possible. Wow!!! I had no idea that Home Depot donated not only supplies but also volunteers to help with the project. I am definitely going to contact them for our Pack. Is there a certain person I need to talk to at Home Depot? Do they only work with scouts or do they work with other organizations also? I am also a volunteer at Royal Family KIDS which is a summer camp for children currently in the foster care system. I would love to also contact them for that organization. Any direction from you Gianna would be helpful for both scouts and RFK.